Applejack is the most loyal and helpful friend, she's a simple girl who loves the countryside life, she enjoys working on a farm and in terms of fashion she is for more comfortable clothes that she can easily pair up with leather boots, cowgirl hats and colorful accessories. But today she feels like she would like to try something new, such as a total makeover, so would you girls like to give her a hand and help our cute Applejack girl look at her best? Start the transformation process with a nourishing facial treatment, then continue with a colorful make up session and finish off by picking her a super fancy outfit to dress her up for the day. First of all, she needs her face cleaned up, her pimples removed, a scrub to get rid of the dead cells, a mud face mask to hydrate her complexion and some fresh oranges on her eyes to refresh them. Then you can go to the next page of the game and pick her a super cute dress to dress her up with, play with her professional make-up kit and create her a colorful make up look, then you can pick her new haircut as well and accessorize her new look with your favorite candy-colored jewelries! 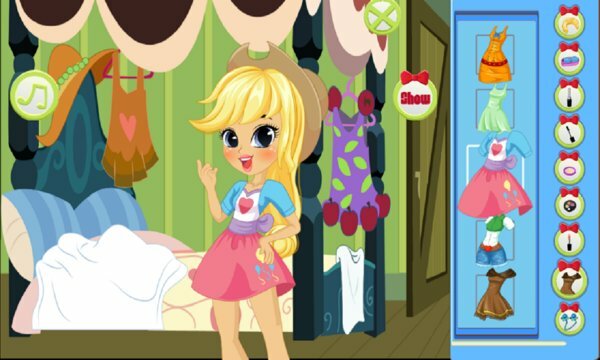 Have an incredible time playing the 'Applejack Makeover' game!